Pistol Pete Shooting Drills Video DVD is a one-of-a-kind in-depth instructional DVD that is mastered to increase the shooting ability of any and every basketball player. 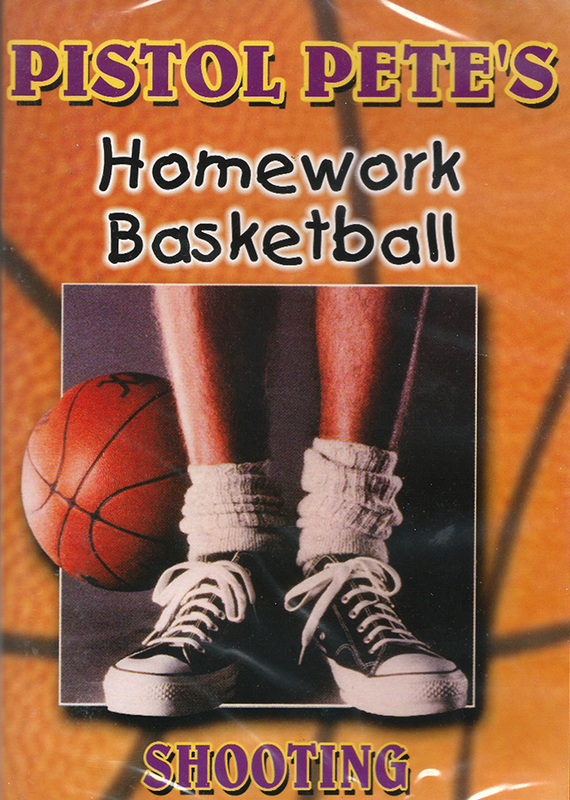 Pistol Pete Shooting Drills Video DVD from the Homework Basketball training series is a one-of-a-kind in-depth instructional DVD that is mastered to increase the shooting ability of any and every basketball player. During Pete’s career at LSU, he racked up 3,667 points and an incredible 44.2 points per game average. Pete accomplished this despite the fact that according to NCAA rules, he could not start as a freshman. He accomplished this despite the fact that during his college years, there was no such thing as a “3 point shot”. During his 10-year career in the NBA, he amassed nearly 16,000 points and a 24.2 points per game average. Look at the record books for yourself; there are few in basketball history that come close to the achievements of Pistol Pete Maravich. You can learn from the wondrous assortment of shots that Pete and his father, Press, took a lifetime to develop. Press Maravich had a dream of basketball and basketball players and what they could become. He taught his son Pete that he could push himself to beyond what everyone thought was capable. He taught him that hard work and dedication is what it would take to be the very best that he could be. These are the same drills, shots, and exercises that young Pete learned as a kid. Then in 1987 Pistol Pete Maravich was inducted into the Basketball Hall of Fame. You now have the opportunity to learn from this same wealth of experience and knowledge – don’t let this opportunity pass you by.